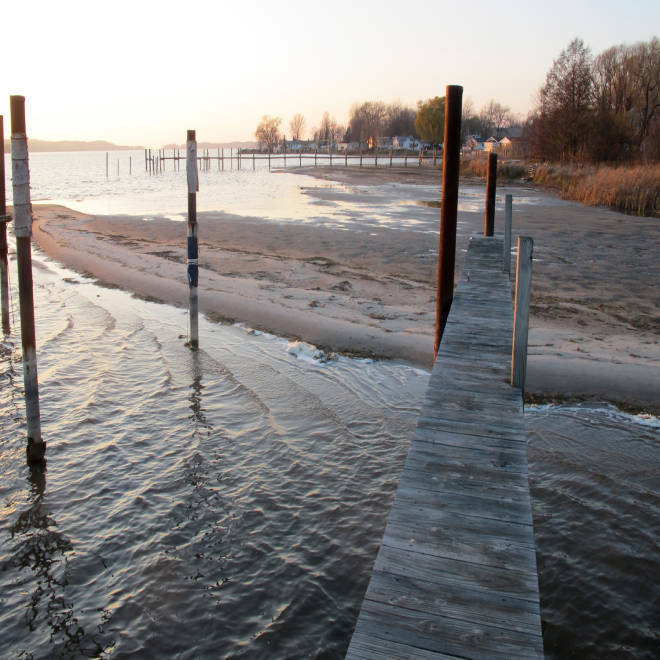 In this Nov. 16, 2012 photo, a sand bar is exposed on Portage Lake in Onekama, Mich., due to low water levels. The waterway is connected by a channel to nearby Lake Michigan where water levels have reached record lows. Two of the Great Lakes have hit their lowest water levels ever recorded, the U.S. Army Corps of Engineers said Tuesday, capping more than a decade of below-normal rain and snowfall and higher temperatures that boost evaporation. Measurements taken last month show Lake Huron and Lake Michigan have reached their lowest ebb since record keeping began in 1918, and the lakes could set additional records over the next few months, the corps said. The lakes were 29 inches below their long-term average and had declined 17 inches since January 2012. The other Great Lakes — Superior, Erie and Ontario — were also well below average. "We're in an extreme situation," said Keith Kompoltowicz, watershed hydrology chief for the corps district office in Detroit. The corps' report came as shippers pleaded with Congress for more money to dredge ever-shallower harbors and channels. Shippers are taxed to support a harbor maintenance fund, but only about half of the revenue is spent on dredging. The remainder is diverted to the treasury for other purposes. Legislation to change that policy is pending before Congress. "Plunging water levels are beyond anyone's control, but the dredging crisis is man-made," said James Weakley, president of the Cleveland-based Lake Carriers' Association. Kompoltowicz said the Army corps might reconsider a long-debated proposal to place structures in a river to reduce the flow of water away from Lakes Huron and Lake Michigan, which are connected. Scientists say lake levels are cyclical and controlled mostly by nature. They began a steep decline in the late 1990s and have usually lagged well below their historical averages since then. But studies have shown that Huron and Michigan fell by 10 to 16 inches because of dredging over the years to deepen the navigational channel in the St. Clair River, most recently in the 1960s. Dredging of the river, which is on the south end of Lake Huron, accelerated the flow of water southward from the two lakes toward Lake Erie and Lake Ontario, and eventually into the Atlantic Ocean. Groups representing shoreline property owners, primarily in Lake Huron's Georgian Bay, have demanded action to slow the Lake Huron and Michigan outflow to make up for losses that resulted from dredging, which they contend are even greater than officials have acknowledged. Although the Army corps produced a list of water-slowing options in 1972, including miniature dams and sills that resemble speed bumps along the river bottom, nothing was done because the lakes were in a period of above-average levels that lasted nearly three decades, Kompoltowicz said. The corps has congressional authorization to take action but would need money for an updated study as a first step, he said. The Detroit office is considering a funding request, but it would have to compete with other projects nationwide and couldn't get into the budget before 2015. "It's no guarantee that we're going to get it, especially in this budget climate," Kompoltowicz said. "But there are serious impacts to navigation and shoreline property owners from this extreme event. It's time to revisit this." Scientists and engineers convened by the International Joint Commission, a U.S.-Canadian agency that deals with shared waterways, issued reports in 2009 and last year that opposed trying to regulate the Great Lakes by placing structures at choke points such as the St. Clair River. The commission has conducted public hearings and will issue a statement in about a month, spokesman John Nevin said. Roger Gauthier, a retired staff hydrologist with the Army corps, said a series of "speed bumps" could be put in the river at a reasonable cost within a few years. Without such measures, he warned, "it would take years of consistent rain" to return Lake Michigan and Lake Huron to normal.